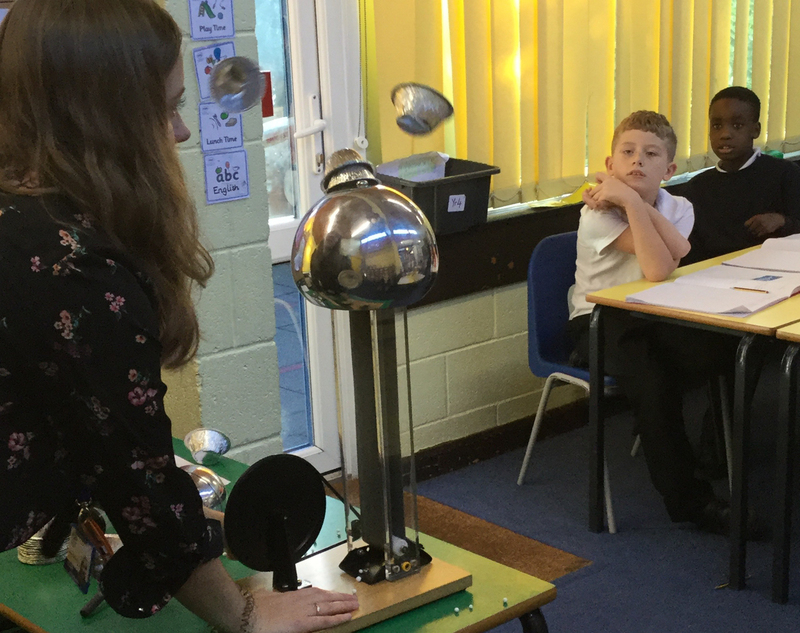 Year 4 looked at positive charges being created by a Van De Graaff machine. They predicted what would happen to things that were placed on the top of the dome of the machine. The tried foil cups, some hair and a tube with foil balls. As the handle was turned it made a wide rubber band turn which was touching a metal strip. This created a positive charge. As both the dome and whatever was on it had positive charges they didn’t want to touch each other. They repelled. That is why the foil cups flew off, the foil balls jumped around in the tube and the hair stood on end! Lots of the children made very accurate predictions. Well done! They clearly made good connections with their learning. This was really fun. This experiment was the second day of science it was a lot better then the first one.